Washington, D.C. (Jan. 15, 2019) -- The National Association of Black Journalists (NABJ) is playing a role in the Freedom Forum Institute's Power Shift Summit 2.0 at the Newseum today. The summit has gathered invited leaders across journalism and the media industry to focus on #MeToo and the media, one year later. NABJ President Sarah Glover is participating as a conversation leader at the summit. 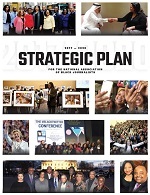 Glover serves as a Power Shift Project advisory board member and is helping to lead the charge to ensure black women and women of color are involved in the much needed power shift in the media industry. 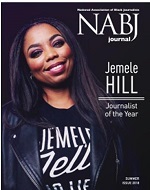 Other NABJ members and black journalists in attendance include NABJ Founder Joe Davidson, Lauren Williams, Lynne Adrine, NABJ Executive Director Drew Berry, Hannah Allam, Sharif Durhams, Sherri Williams, Mizell Stewart, Keith Woods and Richard Prince to name some. The inaugural Power Shift Summit, was held Jan. 9, 2018 and was the first gathering of the Power Shift Project. The gathering gave voice to more than 130 diverse media leaders, journalists, educators, survivors and advocates in the wake of sexual misconduct scandals in the news and other industries. The summit explored the systems and silence behind the abuses and resulted in recommendations and a call for action for meaningful and sustainable culture change. A year after the first Power Shift Summit, it's time for those voices - and others - to be heard again. Follow the Power Shift Summit 2.0 live blog here. Power Shift Summit 2.0 engages participants in a series of conversations about what's changed and what hasn't over the past year, promising practices and strategies, identifying the leaders on the vanguard of change and sharing the untold and overlooked stories about sexual misconduct in the workplace and beyond. The summit features news industry leaders at the forefront of advocating and creating change, as well as journalists who have covered sexual misconduct stories across the country. Reporters will join with diverse experts and advocates for a session on tips and topics for coverage and identifying overlooked and under-covered stories in the workplace and beyond. A highlight of the conversation includes U.S. Equal Employment Opportunity Commission (EEOC) Acting Chair Victoria Lipnic and Commissioner Chai Feldblum, co-chairs of the EEOC's Select Task Force on the Study of Harassment in the Workplace. They plan to discuss the latest EEOC data on sexual harassment, as well as the role of leadership, accountability, training and organizational culture change in preventing and stopping harassment. The Power Shift Project was launched as an industry-wide response to concerns about sexual misconduct in media organizations and a catalyst for change to create safer, more equal and diverse newsrooms. The project provides custom training, education and resources while also raising public awareness and support for building workplace cultures that support diversity, inclusion and equality. Because of space limitations, the summit is invitational, but media industry leaders and educators interested in attending may contact powershiftproject@freedomforum.org for more information. The 2019 summit will be livestreamed on newseum.org/live. Follow the conversation on Twitter with the hashtag #PowerShiftSummit.